Using words and phrases that reflect common courtesy will keep customer–advisor interactions respectful and consequently improve rapport. Here is a run-down of the courtesy words that contact centre advisors should have in their vocabulary, along with guidelines on when they should be used. Before we get into the detail, here is a quick reminder of some of the phrases that you need to avoid. Below are some other examples of phrases that should not be used in customer service and a set of courteous phrases that can be used to replace them. Thank you for your time today I’m glad that I was able to help [Customer Name], is there anything else I can help you with? To assure the customer that their query is a matter of importance, it is vital to provide them with a sense of immediacy. This is also courteous as the advisor is demonstrating that they understand the value of the customer’s time and that they are doing their bit to speed up the process. If the advisor informs the customer as to what they are doing to help them while still on the phone, they are taking control of the situation. This is courteous as it allows the customer to feel as if the problem has been “lifted from them”, while it is also a good tactic to minimise “dead air”. “Dead air” is a period of silence during a customer–advisor interaction, which may damage the rapport-building process. 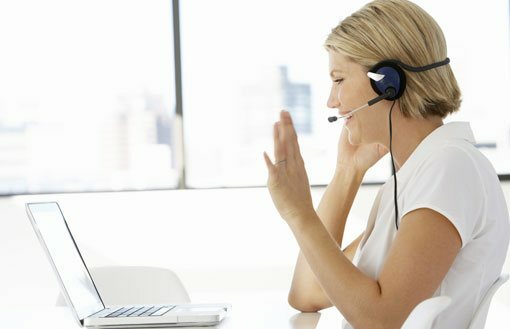 During difficult queries, especially those where the customer has high emotional interest, making a commitment over the phone can help to comfort the customer, which not only helps to show courtesy, but also empathy. To make a commitment, “I will” is the obvious place to start. And following up on this promise will help to establish a basis of trust, which should encourage future customer loyalty. Let’s also look at the most common courtesy words, which can be sprinkled into an interaction as a signal of mutual respect. Don’t forget to say please when asking for information from the customer! Doing otherwise will seem rude and may damage any rapport than had been built previously. When a customer expresses their gratitude, saying “you’re welcome” shows that it has been acknowledged by the advisor. Such acknowledgement statements are a powerful tool in building rapport. Also, using “you’re” instead “you are” makes the conversation sound more natural, taking away the robotic tone many negatively associate with the contact centre. When the customer hands over their information or pays the advisor a compliment, it is important to say thank you. Common sense, right? As a representative of an organisation, it is courteous for an advisor to apologise when something goes wrong. However, an advisor should not say “we’re sorry”, “I’m sorry” should instead be used, so the customer can feel assured that someone has taken it personally upon themselves to resolve their query. Being courteous in an opening statement is a great way to set the foundation for a strong customer–advisor interaction. 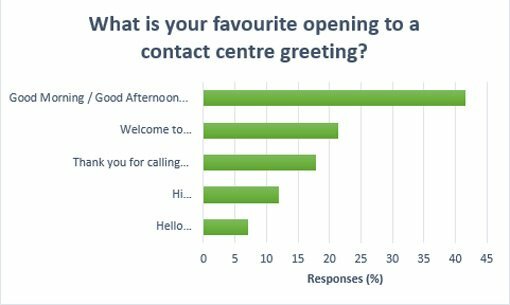 According to our readers, good morning/ good afternoon is the best opening to a contact centre greeting, although “welcome to” and “thank you for calling” were also well received. #tip it is also courteous for an advisor to introduce themselves in their greeting, so the customer has a good idea of how to address them. There will be occasions when the customer feels as though they have fully detailed their query yet the advisor cannot quite understand the situation. In these scenarios, it is important for advisors to use courtesy phrases like those below, so that the customer does not feel as though the advisor was simply not listening to them. While “what” may be more natural, some people might still consider it rude, especially over the phone, where it is more difficult to convey tone. “Pardon me” is a good reflex phrase when an advisor has missed a small part of the conversation. However, when large chunks of information have been lost, “forgive me” is more appropriate. To build rapport, it is important that the customer feels that their thoughts have been acknowledged. However, during difficult customer–advisor interactions, where the customer has discussed an emotional situation, it is important to avoid the phrase “I understand”. This is because the customer may take offence at the suggestion that the advisor shares their emotions in some way. This is effective in terms of acknowledging a problem without voicing any personal thoughts on the matter. This can be used for situations that are not necessarily emotional and, with the repeated use of “I” in the statement, it shows that the advisor is courteously taking personal ownership of the matter. It’s important to remain courteous for the full duration of the call, so customers feel comfortable in voicing more concerns or queries. This consequently boosts satisfaction. Closing courtesy statements of this nature are important and should ideally be customary. Instead of using the standard Thank you for your time today it is much better use the extended alternative closing, I’m glad that I has able to help [Customer Name], is there anything else I can help you with? Using this phrase also helps to highlight to the customer that there are no company time constraints on advisors that would prevent them from providing great customer service. Many of the words and phrases above included personal pronouns, such as “I” and “you”, which are often encouraged in customer service. These can also be labelled as courtesy words. For example, the customer will often prefer the advisor to take personal ownership of their situation, signified by using the word “I”, rather than hiding behind the corporate “we”. In addition, saying “I” and “you” helps to convey interest in the customer as an individual, as the advisor signals to them that they are the priority. While it may be more courteous to address the caller as “sir” or “ma’am”, using this language can feel systematic, as though the advisor is reading from a script. So, instead advisors could try asking the customer if they are happy being referred to by their first name. This is equally courteous, while it is less likely to damage rapport than the method mentioned above. Another option would be to ask the customer directly how they would like to be addressed, which could work to the same effect. While the words and phrases specified earlier will help to convey courtesy, it must be remembered that how you say something is just as important as what you say. It is courteous to sound interested in the matter at hand and smiling can make the advisor sound more upbeat and positive on the phone. One of our readers, Kevin, agrees, stating: “Indeed it does work, we have done practice sessions where two advisors sit back to back and one of them talks and the other listens. In addition to attentive, polite and respectful language, reassuring noises can also be used to show courtesy. These are often known as verbal nods. When the customer speaks for a long period of time, it could be disconcerting to hear silence on the other end of the phone. So, verbal nods such as saying “yeah” or “uh huh” can help to reassure them. This is courteous as it avoids the caller feeling helpless and assures them of the advisor’s focus and understanding. Which other words and techniques can be used to demonstrate courtesy over the phone? I’ve found the phrase “I can help you with that” can have a magical effect. Also, personally, I don’t like “Sorry”. I believe “I apologise” is much stronger.